Sole Superior returns as Street Superior Festival, its biggest and most spectacular edition to date. 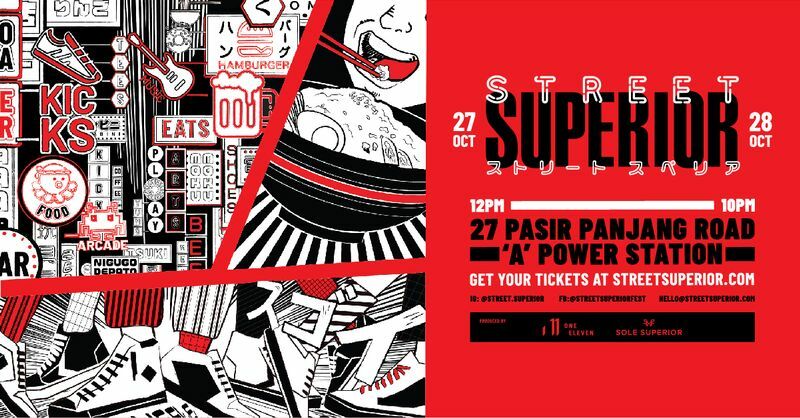 Street Superior Festival 2018 will feature up to 16 showcase brands releasing new launches and exclusive hype editions from SBTG x VeChain, Limited Edt, Casio G-Shock, Timberland, Pony, Under Armour, Obey, Flabslab, Happy Socks and travel deals by Contiki; 70 individual streetwear vendors; 15 food vendors; an eclectic music and art line-up of DJs, flash parkour and graffiti artists; arcade basketball by Under Armour and an in-door skate ramp by Vans x Pirate Life. Located at the historic Pasir Panjang ‘A’ Power Station, Street Superior will occupy 70,000 sq. ft. of raw industrial space, a gathering of subcultures across Sneakers, Streetwear, Music, Digital and Street Art in one venue. Discover the Hall of Flame—a gallery showcase of 200 pairs of rare sneakers with heat and cult status, gathered from local and regional private collectors. Rarely seen, these are never-before-released samples, super-rare heat editions and player exclusives including Louis Vuitton x Kanye West Jaspers, Nike Anaconda AF1, Nike HTM Flyknit Set, Adidas x Jeremy Scott JS Bear collection, and Nike Kobe Bryant Prelude Set. Donate your old kicks to the donation drive organised by Jason Markk x Bystander x Native. These go to Soles4Souls, a non-profit social enterprise who help individuals start sustainable jobs to break the poverty cycle. Any kind of covered shoes in good, wearable condition is welcome, regardless of size or brand. Look out for the Street Superior Raffle Draw where attendees stand to win $30,000 worth of prizes from JD Sports, Casio G-Shock, Jason Markk, Freshly Pressed Socks, and Limited Edt, among others. All attendees holding a festival ticket are eligible for the Raffle Draw, which will happen at various times throughout the festival.